We are proud to partner with our friends at Boulder Hut Adventures to offer this trip of a lifetime! The Boulder Hut covers over 15,000 acres of exclusive tenure and almost 60 named runs to play in. 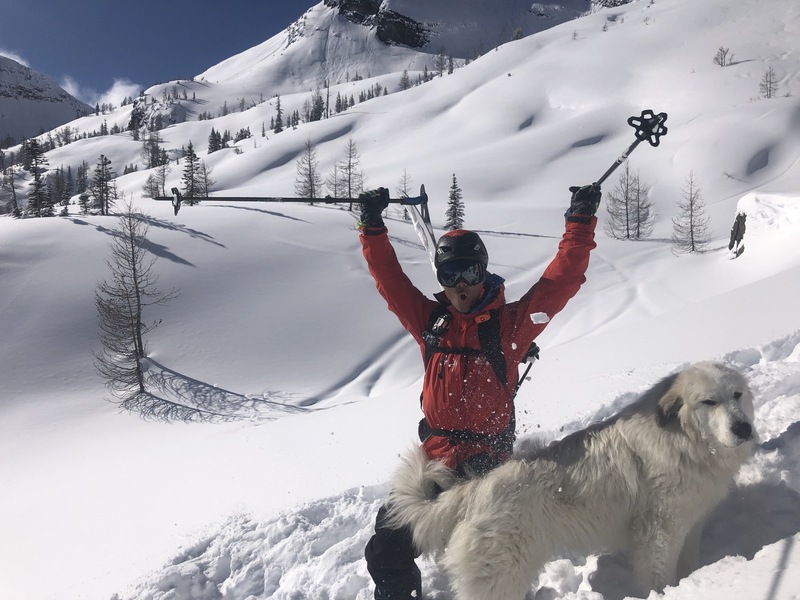 Chutes, high alpine bowls, glades and treed powder skiing give you a choice from the best skiing buffet on the planet, the Purcells. The Boulder Hut sits at tree line (2,000m, 6,500’) with Mt. Higgins and Mt Levesque overhead to remind you of the glaciers that carved this landscape. The Legendary Boulder Hut was built in the late 60’s by Art Twomey and Margie Jamieson, who pioneered one of the first commercial backcountry lodges. Fast forward to 2005 when my friends Mark and Sarah Yancey bought it and committed their family to the backcountry lifestyle. Their lodge reflects this commitment to authenticity dedicated to enhancing the human experience in remote outdoor adventure.Mark and Sarah’s hospitality means nutritious, delicious home cooked meals in a comfortable lodge with great company and a long standing history of guided epic adventure. The Boulder Hut provide you everything you need for a comfortable stay and nothing that you don’t. Group ability and interest will dictate how much each group is able to ski. Our terrain offers a wide variety of objectives including long alpine runs of 1500-2500’ or 1000-1500’ treed runs. We try to guide to the median skier in the group. If we have a significant difference in abilities, we split the group to accommodate different objectives. An average intermediate group can expect 4-5000 vertical feet a day which can be 3-5 runs. An average, strong keen expert group can get 5-7000’ vertical a day which can be 4-8 runs from these 59 named runs. Day 1 AM-Assemble @Kimberly Mountain Resort and fly in. Check in at the hut, eat and have a safety orientation followed by a short tour. Days 2-7 Eat a hearty breakfast and tour to your groups abilities and current snow conditions allow, 4-7,000′ per day. Eat, drink, sleep and repeat! Day 8 Pack up and return to Kimberly and head back home with great memories and new friends! We work with Ascent Outdoors who rents full ski and splitboard packages as well as beacons, shovels, and probes here. If you need these plus touring equipment, Quantities are limited so please contact us as soon as possible if you are interested. Excluding ski gear-35 pound weight limit on clothes.Follow the equipment list and it will be plenty. We’re deep in the Purcell backcountry and relatively easy to get to. Guests meet at Kimberley Alpine Resort and are flown in by Astar 350 helicopter to Boulder Hut. Please plan your travel itinerary giving yourself a buffer (a day on each end) to accommodate delays due to stormy weather. These could include your incoming flight not arriving on time or a weather delay in helicopter transport out from the hut. In the winter it snows here. A lot. Canadian Rockies International Airport in Cranbrook, BC (YXC). Take the shuttle (30 minutes) to the resort. Boulder Hut guests receive discounts on lift tickets and lodging at the resort. Email us for details. To make the beginning or end of your trip more enjoyable, we have partnered with Kimberley Alpine Resort to offer discounted room rates and lift tickets. To take advantage of this deal please email us at least a week in advance. For information on other lodging options before or after your stay with us and things to do in Kimberley visit theTourism Kimberley website.